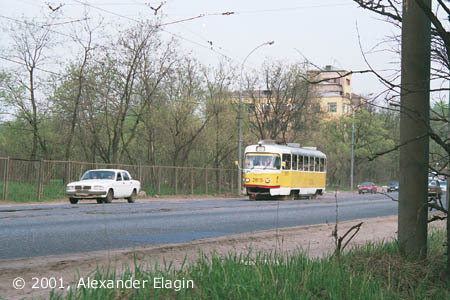 The tramway line connecting Rostokino district and Bogorodskoye began regular service on November 18, 1951. 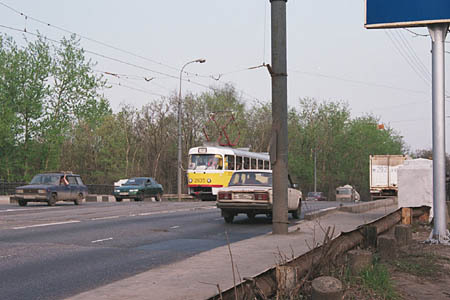 This line was the second one to connect Rostokino to the city tram network, and after an unexpected closure of the Prospekt Mira line in 1995 this one remains the only link. Unfortunately, the line remains street-running, and as too many cars also have liked this convenient direction, the number of accidents and jams have increased significally, too. 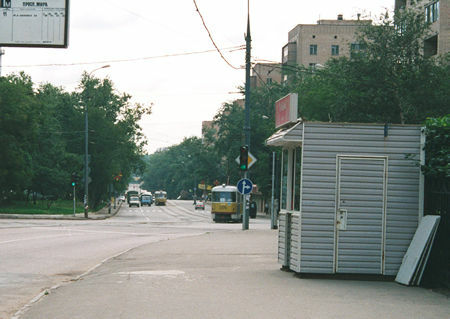 The city administration in 2001 adopted the plan of reconstruction of this street, including moving tramway tracks to a reserved row, but when and whether the plan would be implemented is currently unknown. A crossing of Yaroslavskaya Street and Borisa Galushkina Street. Tramway tracks have no special right of way in this street. 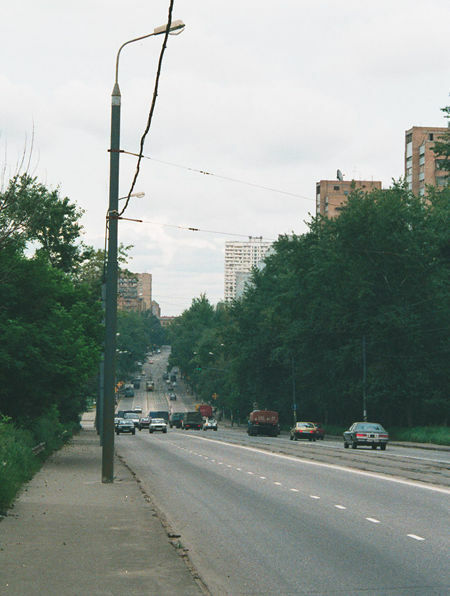 A view of Borisa Galuskina street from the top of a railway overpass. the street is indeed very green. The lowest place here reminds of Kopytovka river, tubed many decades ago. I still cannot figure out why an open water has been so actively avoided when planning new districts. Anyway, the course of Kopytovka can be easily guessed in our days when one looks at Raketniy Boulevard and Zvyozdniy Boulevard, for the river flows right beneath them. A Tatra T3 tramcar crosses the railway overpass. Here it stops for a few seconds before a steep downgrade (shown in the previous photo) . Having crossed the railway, the road goes on under another name - Rostokinskiy Proyezd. 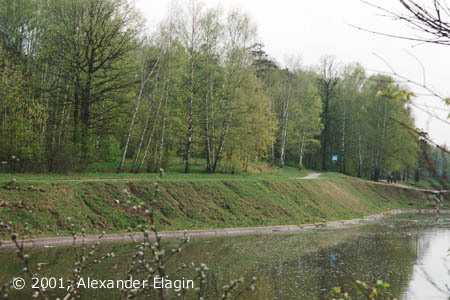 It was laid in early 1950's at the edge of a large Sokolniki forest, simultaneously with the railway overpass construction. Today this district remains lightly urbanized. One of the largest sources of passengers is the Foreign Languages Institute (beyond the trees in this photo). Yet trams are always overcrowded with transit commuters. Rostokinskiy Proyezd ends at the crossing with Bogorodskoye Shosse. 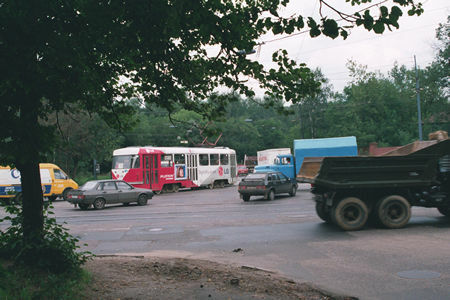 The tramcar in this photo is turning towards Bogorodskoye community, while cars and trucks are trying to agree who must move the first. Unfortunately, too many drivers in Moscow suffer from a road rage (or, less politely, from a lack of good manners and good will towards other drivers, pedestrians and mass transit).